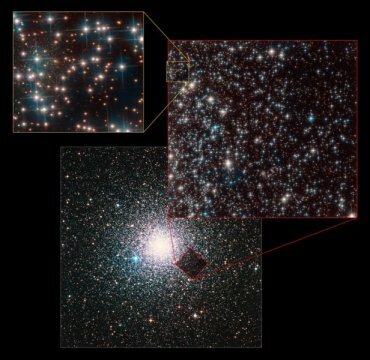 Astronomers using the NASA/ESA Hubble Space Telescope to study some of the oldest and faintest stars in the globular cluster NGC 6752 have made an unexpected finding. They discovered a dwarf galaxy in our cosmic backyard, only 30 million light-years away. The finding is reported in the journal Monthly Notices of the Royal Astronomical Society: Letters. An international team of astronomers recently used the NASA/ESA Hubble Space Telescope to study white dwarf stars within the globular cluster NGC 6752. The aim of their observations was to use these stars to measure the age of the globular cluster, but in the process they made an unexpected discovery. In the outer fringes of the area observed with Hubble's Advanced Camera for Surveys a compact collection of stars was visible. After a careful analysis of their brightnesses and temperatures, the astronomers concluded that these stars did not belong to the cluster -- which is part of the Milky Way -- but rather they are millions of light-years more distant. Our newly discovered cosmic neighbour, nicknamed Bedin 1 by the astronomers, is a modestly sized, elongated galaxy. It measures only around 3000 light-years at its greatest extent -- a fraction of the size of the Milky Way. Not only is it tiny, but it is also incredibly faint. These properties led astronomers to classify it as a dwarf spheroidal galaxy. Dwarf spheroidal galaxies are defined by their small size, low-luminosity, lack of dust and old stellar populations . 36 galaxies of this type are already known to exist in the Local Group of Galaxies, 22 of which are satellite galaxies of the Milky Way. While dwarf spheroidal galaxies are not uncommon, Bedin 1 has some notable features. Not only is it one of just a few dwarf spheroidals that have a well established distance but it is also extremely isolated. It lies about 30 million light-years from the Milky Way and 2 million light-years from the nearest plausible large galaxy host, NGC 6744. This makes it possibly the most isolated small dwarf galaxy discovered to date. From the properties of its stars, astronomers were able to infer that the galaxy is around 13 billion years old -- nearly as old as the Universe itself. Because of its isolation -- which resulted in hardly any interaction with other galaxies -- and its age, Bedin 1 is the astronomical equivalent of a living fossil from the early Universe. The discovery of Bedin 1 was a truly serendipitous find. Very few Hubble images allow such faint objects to be seen, and they cover only a small area of the sky. Future telescopes with a large field of view, such as the WFIRST telescope, will have cameras covering a much larger area of the sky and may find many more of these galactic neighbours. The Hubble Space Telescope is a project of international cooperation between ESA and NASA. The results were presented in the letter The HST Large Programme on NGC 6752. I. Serendipitous discovery of a dwarf galaxy in background, published in the journal Monthly Notices of the Royal Astronomical Society: Letters.